In multilayer white organic light-emitting diodes the electronic processes in the various layers—injection and motion of charges as well as generation, diffusion and radiative decay of excitons—should be concerted such that efficient, stable and colour-balanced electroluminescence can occur. Here we show that it is feasible to carry out Monte Carlo simulations including all of these molecular-scale processes for a hybrid multilayer organic light-emitting diode combining red and green phosphorescent layers with a blue fluorescent layer. The simulated current density and emission profile are shown to agree well with experiment. The experimental emission profile was obtained with nanometre resolution from the measured angle- and polarization-dependent emission spectra. 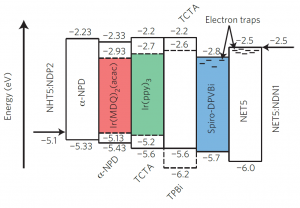 The simulations elucidate the crucial role of exciton transfer from green to red and the efficiency loss due to excitons generated in the interlayer between the green and blue layers. The perpendicular and lateral confinement of the exciton generation to regions of molecular-scale dimensions revealed by this study demonstrate the necessity of molecular-scale instead of conventional continuum simulation.